"Write-in" and write in the name of the candidate on the line provided. completamente el espacio cuadrado a la izquierda de su seleccion. No haga marcas extraviadas. nombre del candidato en la linea provista. 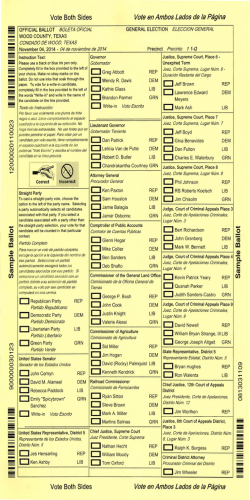 Straight Party: To cast a straight-party vote, choose the Option to the left of the party name. thatcandidate will be counted in that particular contest. de partido completo, su voto por ese candidato se computara en esa carrera. projects, not to include toll roads."